Anaerobic digestion generates a wide range of byproducts that farmers can use in their farming operations or sell. Beyond biogas used to generate electricity or as fuel, and liquids used for fertilizer or soil amendments, there are solid byproducts, which have a wide range of applications. Undigested biomass (referred to as digestate solids, fiber or biofiber) contained in the effluent (digestate) of anaerobic digesters provides opportunities for value-added byproducts. Organic fertilizer, livestock bedding, compost, fuel pellets, and construction material (medium density fiberboard and fiber/plastic composite materials) are a few examples of value-added byproducts that could be created from digestate solids. Solids can be extracted from the digestate using solid-liquid separation technologies such as slope screens, rotary drum thickeners and screw-press separators. Common solid-liquid equipment can produce digestate solids with a moisture content of 18 to 30%. The volume and the moisture content of the separated solids will vary depending on the technology used. Digestate solids are high in fiber, consisting mainly of fibrous undigested organic material (lignin and cellulose), microbial biomass, animal hair, and nutrients. During the anaerobic digestion process, nutrients contained in the feedstock are mineralized. 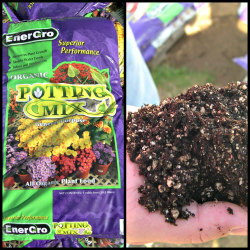 Mineralized nutrients are easily used by a crop. Digestate solids contain higher concentrations of plant-available nitrogen and phosphorus compared to as-excreted manure, according to research. The high carbon content of digestate solids adds organic matter to the soil and improves the water holding capacity of the soil. Actual nutrient content of digestate solids will vary depending on feedstocks, digester type, management, and solid-liquid separation technology. Digestate solids as a fertilizer source can be used “as separated” (wet), blended with other materials and composted or dried and pelletized. Bedding for livestock is another opportunity for putting digestate solids to use. 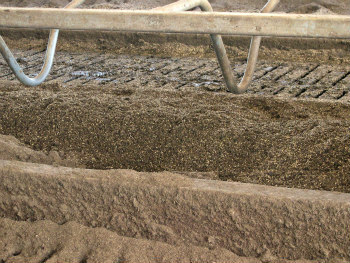 Utilizing digestate solids for bedding provides a significant cost offset to dairy and livestock farms. In addition, excess solids may be sold to neighboring farms for bedding or soil amendment, creating a revenue stream and route for nutrient export. Bedding with digestate solids requires intensive management to ensure that a healthy environment, with low pathogen concentrations, is provided for the animals. Digestate solids can also be used as substrate in compost, providing sources of carbon and nutrients. 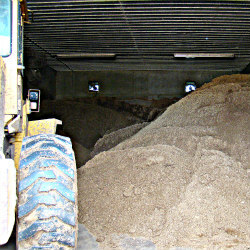 Solids can be dried and pelletized for use as fertilizer or fuel. 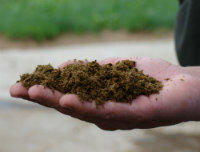 The maximum energy content of livestock manure is 8,500 Btu per pound; however ash and moisture content reduce the energy potential. As excreted, livestock waste typically has an energy content between 1,000 and 2,000 Btu per pound. Another developing opportunity for digestate solids is as a renewable construction material. Medium-density fiberboard and wood/plastic composite material have emerged as important engineered construction materials. These engineered materials can also be created using digestate solids without sacrificing mechanical or aesthetic properties, research indicates. Gould, M.C. and M.F. Crook. 2009. On-farm Anaerobic Digester Operator Handbook. Michigan State University. East Lansing, MI. Kammel, D.W. 2004. Bedded Pack Housing for Dairy Cows. Minnesota/Wisconsin Engineering Notes. Matuana, L. and M.C. Gould. 2006. Promoting the Use of Digestate from Anaerobic Digesters in Composite Materials: Final Report. Community Energy Project Grant No. PLA-06-42. Zering, K. and B. Auvermann. April, 2009. Livestock and Poultry Environmental Learning Center. Value of Manure as an Energy Source. What are typical values for the higher heating value of manure scraped from cattle feedyard surfaces? eXtension FAQ #27557. Introduction to Anaerobic Digestion – Curriculum. 2012. Bioenergy Training Center . Economics of Anaerobic Digesters for Processing Animal Manure. Cornell University Cooperative Extension, 2010.